The South Korean motorcycle maker, Hyosung, has come up with the several offering in the public as the Hyosung has unveiled its iconic machines at the 2015 EICMA Show in Milan. 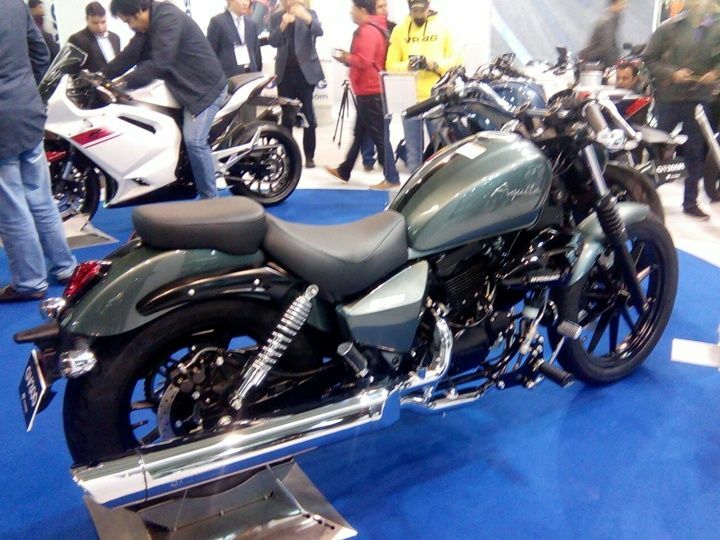 Most of them will be shipped in the country through its Indian partner DSK Motowheels. The company has introduced its new offering in the cruiser segment, namely, GV300. Along with the firm has also showcased GT650R and GT300R at the 2015 EICMA. It is the most affordable from the company stable that is likely to be launched in the global market soon. Moreover, the low slung seat and raised handlebar make it more promising, in terms of riding ability. The new GV300 has an all new design that includes all-black alloy wheels, a new tear-dropped fuel tank, split seats and a round headlight that add more bits in its appealing. It also has a plenty of chrome finishing on the exhaust, rear view mirrors, handlebar and rear suspension while the rest of parts like alloy wheels, engine, front forks and rear side panels are finished in Black color. Being a cruiser motorcycle, the manufacture has built the motorcycle in well manner from every dimension as it is 2294mm long, 1130mm wide and 875mm tall. It gets a wide rear tyre that endows skid free ride on any kind of surfaces. The GV300 comes fitted with a front telescopic suspension and hydraulic double shocks at the rear. The braking capability of new cruiser motorcycle is pretty much standard as the motorcycle is featured with 300mm front disc brake and 270mm rear disc brake, both the which are programmed by ABS. The GV300 houses the same 275cc motor that also powers the GT300R, as the new cruiser motorcycle is power by a 275cc V-twin, 8-valve motor that returns 27.6 BHP of power at 10,500 RPM and makes 23.5 nm of torque at 7000 RPM, the motor is coupled with a same five speed transmission. It has a kerb weight of 178 KGS.